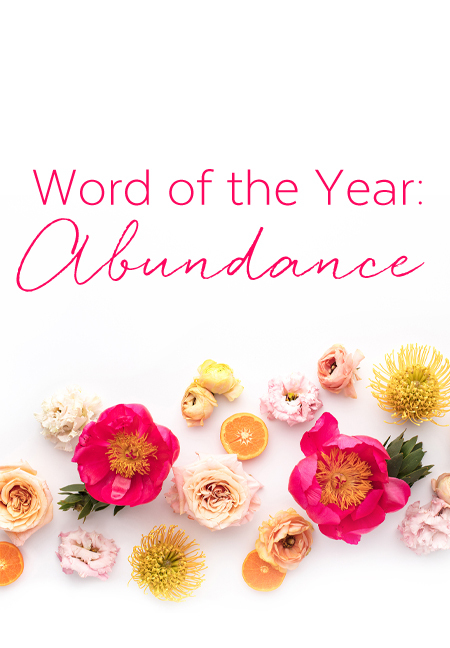 God made it clear through the process of my Powersheets and months of praying for revelation: 2018 is my year of abundance. Abundance is not about what I do or don’t have; it’s about remembering who Jesus is and what He’s already done for me on the cross. It's a fresh year where God is beckoning me to remember what He’s already taught me, how He’s already claimed victory in my life, and why I can agree with His abundance right where I am in every season. Last year I learned so intimately that Jesus is my Good Shepherd. The Lord made His word from John 10 come alive in my heart, mind and soul month after month. Because He is my Good Shepherd I stand in the midst of abundant life right here, right now. Last year just didn’t feel abundant. It felt hard. Really hard. That’s the thing about feelings though; they're fickle things changing as often as winter weather in the South. But God! He says our life is abundant no matter our feelings or circumstances. When I pan out to see the big picture of 2017, it may have been hard but it was absolutely blessed with abundance of His presence. So, here I am emerging from the weight of 2017 not because my circumstances have necessarily changed but because my understanding of who Jesus is has grown. He is abundance in every circumstance so long as I abide in Him then I have life to the full. Scripture would define abundance as: overflow (Phil. 1:9); over, above and exceedingly (John 10:10); fullness (Psalm 16:11). It's being known by Jesus and knowing who He is. I have abundance because I have Christ. This year, may I agree with the abundant life I have in Christ. May the work of my hands, the words of my mouth and the posture of my heart be that of worship to my Savior. Allowing margin for relationships to take root. Living on mission where He's planted me. Seeing Jesus as restorer, redeemer and friend. Leaning into our local church, the church body and our women’s ministry. Learning to see others first and foremost as image bearers of Him. Seeing others through the eyes of the Father. Serving others selflessly in new ways. Intentionally investing in people who may not be like me, but will make me more like Christ. Seeing abundance in places I once rushed by or deemed invaluable. Delighting in His presence of the ordinary everyday. Cultivating new rhythms, both mentally and physically, to truly experience God's presence in the small things of daily life.